I found this tag on A Book Lover’s Playlist. Well, living in Florida means that I do not really get a chance to experience the leaves changing, which would be gorgeous! Honestly, I just love the reprieve from the summer heat that we get during fall, without it being too cold to enjoy outdoor activities. And I love, love the clothes that I get to start wearing! Sweaters, leggings, tall boots and socks. Beanies and scarves! I love colder weather clothes and I hardly get to use them! 2) What book on your shelves reminds you of going back to school/your school days? All of the books that I had to read for school do. At least the ones I enjoyed enough to keep. The one that comes to mind currently is The Narrative of the Life of Frederick Douglass, an American Slave, which was a summer reading assignment for AP History. It was so good! It was informative, insightful, and very interesting. Definitely a must read if you are into American history. 3) Find a book on your shelf which has something Autumn related on the cover. 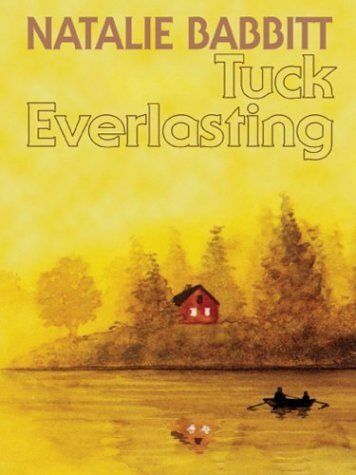 My copy of Tuck Everlasting looks pretty fally to me, like a cozy day on the lake with the changing colors of the forest around you. And a warm little cottage to go home to. 4) What is your favorite horror/Halloween story? 5) What is your favorite horror film? Ok, so the previous question said horror OR Halloween, so first I must let the world know that my favorite Halloween movies to watch are The Rocky Horror Picture Show and Hocus Pocus. However, if we are talking strictly horror, then I think I would go with The Skeleton Key. That movie was super creepy to me. I am not a huge fan of horror movies and I tend to find psychological horrors more frightening than gore. Another one that really disturbed me was some random movie I found on Netflix called Lovely Molly. 6) Which book release are you most looking forward to this Autumn? I was looking forward to Origin by Dan Brown coming out, as well as All the Crooked Saints by Maggie Stiefvater. 7) Which film release are you most looking forward to this Autumn? Blade Runner 2049 because Ryan Gosling. Kingsman II, but I am not sure when that came out. I also kind of want to see It and Mother, because I have heard so much about them…but I am also afraid. I honestly don’t know if Mother is supposed to be a scary movie, either, but it seems strange and kind of creepy. 8) Which three books are you hoping to read this season? I am currently finishing up both Bury my Heart at Wounded Knee and An Enchantment of Ravens. Then, I plan to read The Girl in the Tower by Katherine Arden, The Tethered Mage by Melissa Caruso, and This Savage Song by V.E Schwab. Thank you for checking this out and please tag yourselves to join in! Let me know what you think of Autumn this year.